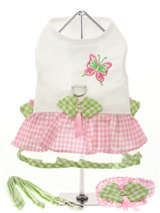 If you want your girly pup to be the best dressed pooch in town, then our dog dresses are vital for any dog's wardrobe. 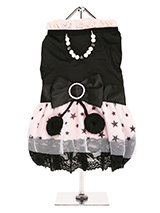 With formal and casual dresses, you can be sure that your pup will be dressed for any occasion. 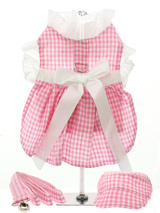 Most of our dresses are 100% cotton to make sure your dog is comfortable as well as stylish. Alongside this, our dog dresses include double sized/double strength Velcro tabs for comfortable and secure fastening, ensuring that the dress is easy to put on, take off and stays on during all of your dog’s activities. 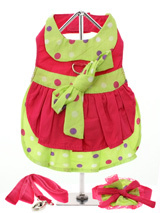 Some of our dresses, such as the hot pink and polka dot harness dress, come complete with a matching lead and hat (that can also be used as a fashion collar), along with a sturdy reinforced D-ring. Most of our dresses, particularly our formal dresses, have a harness included in the dress making it easier to attach a lead. We also have some more casual designs, but despite their casual materials, they still retain an element of bling. 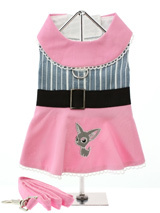 Some of our dog dresses are made of high quality satin and other exquisite materials and have been designed by some of the top designers in the dog fashion world. 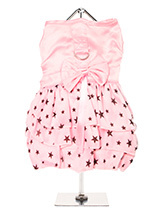 At Urban Pup we have the beautiful dog clothes that you've been looking for so your dog can be the best dressed in town. 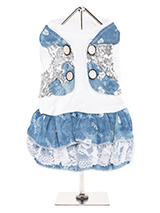 If your little puppy is looking for a designer dress to complete her wardrobe then we have exactly what you need, ranging from formal to casual and everything in-between. 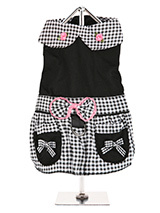 Made from some of the highest quality materials and selected by some of the top designers in the dog fashion world, our dog dresses are some of the best on the market. For more information on our dog dresses, or if you have any other general enquiries, don’t hesitate to contact a member of our team.